Cinechem Chemistry supplying all processing chemistry in liquid concentrates to ensure the highest quality and consistency of the finished product. 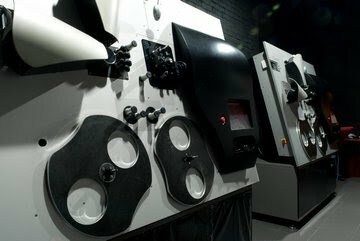 Our facility is equipped with the latest Cinevator Five real-time machines from the innovative Norwegian company Cinevation. This machine produces positive prints including both digital and analogue sound and subtitles; the picture quality is unrivalled in terms of sharpness and contrast. The Dolby sound printing produces the highest possible Dolby DQI readings (90 easily), meaning that each print can be screened many times before sound quality is reduced. Each copy is printed separately from the original DI source, so the picture quality on the film is significantly higher than it is with the traditional contact print method. Moreover, the quality of every copy is consistent, as there is no wear of intermediate negative. Due to the innovative printing process, the original Interneg and sound negative are not required therefore the Cinevator Five recorder enables fast and flexible printing of small volumes of material — a festival/show copy with subtitles is a simple task, each copy can even be in different language or with different subtitle styles. Content preparation prior to printing is performed with a powerful Clipster workstation manufactured by DVS from Germany. Source material can be provided in a variety of formats including DPX, Cineon and TIFF with resolution up to 4K. 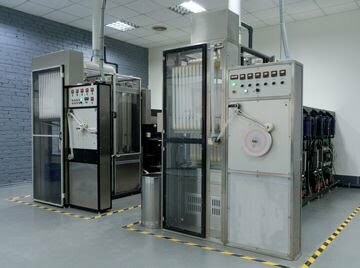 Our laboratory facility is equipped with a Cinetech UK processing machines capable of 200 feet (66 meters) per minute output speed and is specified to the latest Kodak ECP-2E process. Our production capacity is 30 full-length movie copies per day. We use print stock from Kodak and Fujifilm depending on our client’s preference. We also use quality controlled Cinechem chemicals in our production. To ensure an extremely high and consistent chemical quality, we use an automatic Rockwell Hitec chemical mixing system, the only such system available on the market today. Extensive quality control checks of the chemical solutions are performed every day. CPC have installed environmentally-friendly chemical recycling systems that allow up to 80% of the chemical solutions to be recycled and reused, without affecting our high levels of quality. The subsequent cost savings are just one reason why our prices are so competitive. The laboratory performs the sensitometric testing of each raw stock type using an X-rite densitometer, with a calibration check before each operation. Visual and sound quality inspection of EVERY finished print is carried out by our experienced operators on a Steenbeck viewing machine. 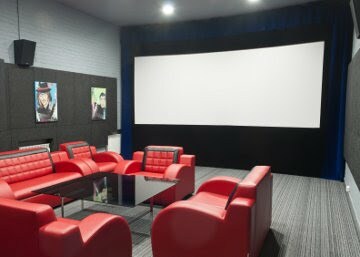 For a comfortable viewing experience we have our own luxury preview theatre that can accommodate up to 15 patrons. Our Projection booth is equipped with an Ernemann E15 film projector and lenses for 1.85:1, 2.39:1. We can also screen the over-under 3D film format. CPC lab is capable of 24/7/365 operation.